The Landscape Assessment Tool (LAT) is in itself a mini-toolbox for, inter alia, the analysis of ecosystem services of mountain forest landscapes. The tool can be downloaded and runs on the client computer. The Landscape Assessment Tool (LAT) software runs directly on a client computer (PC or laptop) and needs to be downloaded and installed from the ToolBox. The LAT contains at the moment four separate tools that operate on the same representation of forested (mountain-) landscapes. 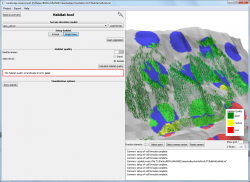 In addition, the tools share also technical infrastructure (e.g., 3d visualization, processing of GIS files, et cetera). 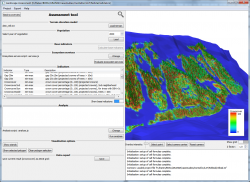 The “Landscape level analysis” tool allows mapping and analysing of simulation data from the ARANGE project providing an landscape level view. LAT furthermore contains a tool that allows the creation of realistic single-tree based forest structures by jointly processing sample plot or inventory data together with remote sensing based data. A third tool of the LAT “tool box” is dedicated to the assessment of ecosystem services and natural hazards on landscape scale. And, finally, the bird habitat quality estimates the habitat suitability for bird species on landscape scale. The tool is well suited providing an addition to forest simulation models (on stand level). It can be used to generate input data for such models (i.e., generating forest structure information from empirial data), or to analyze the results of forest models (e.g., landsacpe level analysis of the protective function). On top of that, the tool provides a beautiful 3d rendering of forested mountain landscapes, which can be very useful for stakeholder communication. The binary software package for the Landscape Assessment Tool is readily available for Microsoft Windows platforms, but can be executed also for Linux and Mac operating systems. For the latter case, users would need to compile the available source code for their respective target machines.Installation is easy and boils down to extracting the download folder to the target machine. LAT comes with the exeutable, additional documentation and ready-to-use examples. Extract the contents of the ZIP file to your computer. The software requires Microsoft Windows operating system (XP/Vista/Windows 7/8/10). The Landscape Assessment provides powerful 3d visualization of forested mountain slopes. Bird habitat quality can be assessed using various spatial pattern.